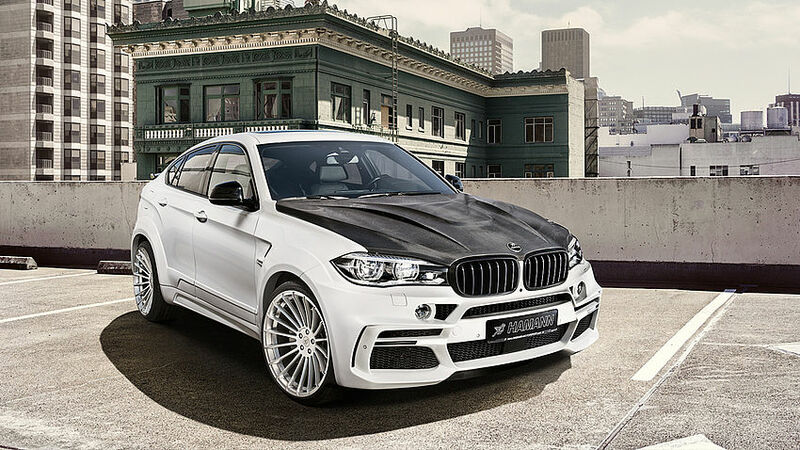 HAMANN MOTORSPORT underlines the powerful appeal of the BMW X6 (F16) with its wide-body kit. Advances the power of the diesel engine to impressive 462 hp. And puts the brawny coupé on unique 23-inch wheel rims. The refiner from Laupheim utilises its complete craftsmanship and technical know-how to present every BMW X6 customer an exclusive and unique package. With its stunning wide-body kit HAMANN once again sets the standards for BMW tuning. The special eye-catcher is the bonnet completely made of carbon fibre that comes with TÜV part certificate. Sharp edges flank the power dome that gives an idea of the concentrated power beneath the bonnet. Under the radiator grille, the tuning professionals installed the bumper with a front skirt that reaches far down. It is wider than the standard skirt for the exclusively manufactured wider wings to be accurately installed on the standard body. The width grown by around 12 cm provides enough space for the well-dimensioned wheel/tyre combination. Profiled door panels and side skirts complete the lines from the front wings to the rear wheel houses. 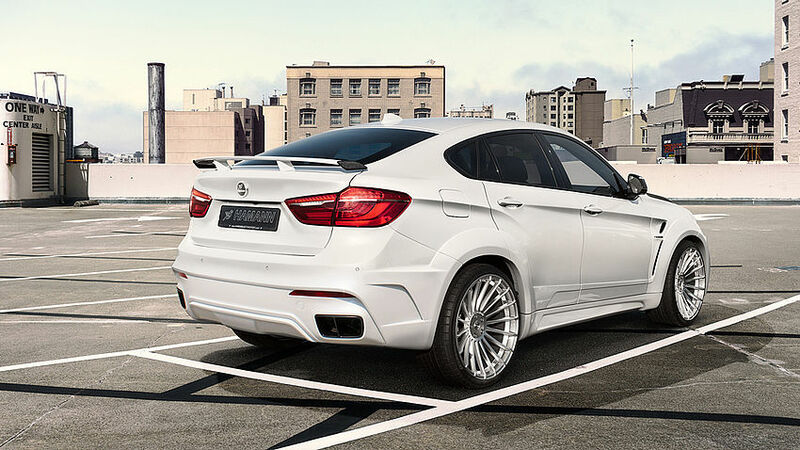 The rear skirt of the tuned BMW X6 is a class of its own, as it perfectly integrates the stainless-less steel sports exhaust system with three or four centred pipes. HAMANN additionally decorates them with aluminium tail pieces milled in one piece. 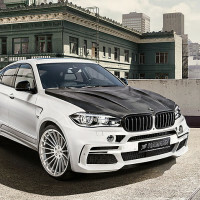 And thanks to chip tuning HAMANN coaxes some additional potential out of the BMW X6 engines. The control module advances the power of the diesel engines X50d, xDrive 40d and xDrive 30d as well as the petrol engines xDrive 50i and xDrive 35i. The ultimate top mark is achieved by the potent M50d, which HAMANN pushes from its standard 381 hp to 462 hp. The peak torque is then tremendous 890 Nm at 2000-3000 rpm. Of course, the increase in strength is not all. HAMANN MOTORSPORT developed a new set of sport springs, which are especially aligned to the crossover’s axle load and high performance level to noticeably upgrade driving dynamics and look. Thus, the X6’ centre of gravity is lowered by approximately 45 mm on the front axle and by approximately 30 mm on the rear axle. Now that body, engine and suspension of the BMW X6 are brought to the highest level, the only items missing are some exclusive light-alloy wheels. The ensemble’s star is the “Anniversary Evo” in black, silver or hyper black which comes with a noble black/silver lustre, equipped with the high-performance Conti Sport Contact 5P 315/25 R23 tyres. Fancy on the outside and some beautiful highlights in the inside – that is where HAMANN’s interior extras come in. Cockpit, headrests and the entire foot space is individualised with sport pedals and high-quality applications. A special BMW tuning detail are the car door LED welcome lights projecting the Hamann logo on the floor – understatement at its best facilitating the access to the car.